Do you have a forever~growing list? Not just the laundry but a laundry list! 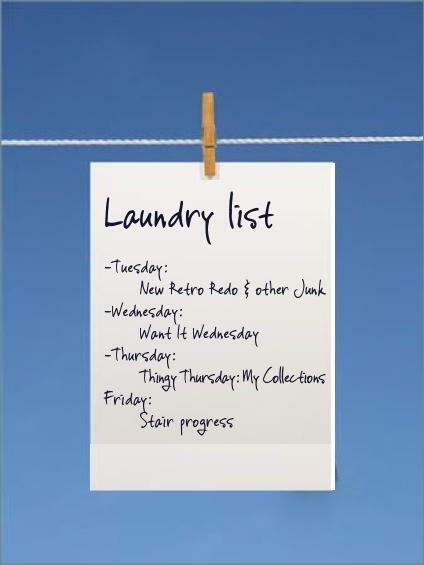 The list that seems to never end, just like the laundry! I have one, or two, or three, or more! I don't know how many really, because I write them and then lose them. Today, I will blog it! My laundry list, and maybe, just maybe, I will accomplish something on my list, before it gets lost. 1. Tear down metal shed, remove wood floor. 3. Cut all trees that overhang my yard from the neighboring yards. 4. Reseed and plant summer lawn. 6. Build patio cover of some sort. 8. Buy new shed, only large enough for yard tools, lawn mower, etc. 9. Weed and clean up front yard, plants??? 10. Master bath needs baseboards replaced. 11. Guest bath needs baseboards replaced. 12. Clean, paint and decorate laundry room. 13. Office needs an overhaul. 14. Continue to go through Mark's belongings, tools, garage, and shed stuff. 16. New carpets/flooring in 3 bedrooms. 17. Dust and clean all (5) ceiling fans. 18. Get ready for yard sale June 2. 19. Sale or donate Malibu. 20. Talk with A about the 'truck'. 23. All outside door handles need to be replaced or painted. 29. Start December daily 2011. 30. Replace weather stripping on all three outside doors. 31. Replace molding on both garage doors. 33. Learn how to play video games with M, instead of just watching him. 34. Swim a LOT this summer. 35. Recover or replace patio chairs. 36. Clean BBQ and fill both propane tanks. 38. Oh yeah, work full-time, cook, clean, do the laundry, and play with those beautiful grandbabies. OK, so I feel like that is a good start to my summer list. What about you? 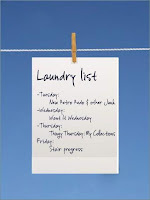 What do you have planned to accomplish and cross of your laundry list? Hi, at least having it on the blog you won't lose this list. I'm the same way, I write lots of lists but never look back at them. Probably would be a good idea to try and find some cheap help for some of the jobs. Look at one of the LifeBoat members, she asked for help with her yard and got it. Don't overwhelm yourself, things will get done when they need to be done. I'm a major list girl. I have a daily list and then a more long term list. The long term list is usually in my head but it is still a list. Go for it!